Back ground: Endoscopic balloon dilation (EBD) and laparoscopic Heller-Dor operation (LHD) have been considered effective treatments for achalasia. Although most young patients required surgical intervention usually after repeated EBDs, these patients in Japan traditionally undergo EBD as a primary treatment because of minimally invasive of EBD nature as compared to LHD. The aim of this study is to evaluate surgical outcome of LHD for young patients with achalasia. Material and Method:The patients under 30 years of age who underwent LHD in our institution were extracted from the database. We analyzed patients’ background, pre- and post-operative symptom scores, and surgical results. Moreover, the surgical results of these patients were compared to those of patients equal to or over 30 years of age during the same study period. Results:Forty-five patients met our inclusion criteria (male; 20, female; 25). As compared to older patients, preoperative body mass index in younger patients was significantly lower (p=0.016) but there were no significant differences in preoperative symptom scores except for frequency of chest pain. 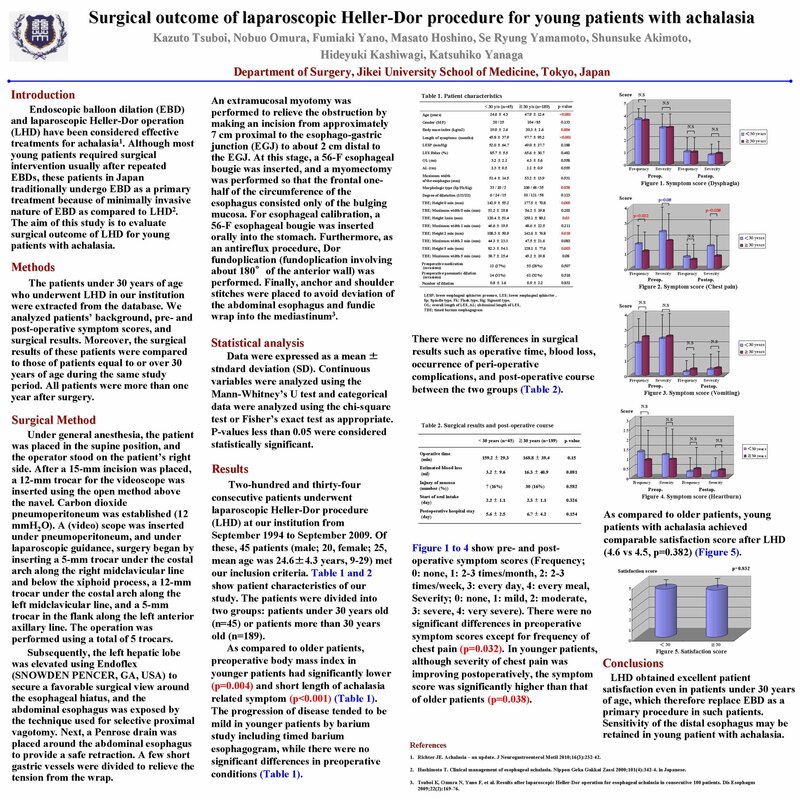 There were also no differences in surgical results such as operative time, blood loss, occurrence of perioperative complications, and postoperative course between the two groups. In younger patients, although severity of chest pain was improving postoperatively, the symptom score was significantly higher than that of older patients (p=0.038). However patient satisfaction was comparable between the two groups. Conclusion: LHD obtained excellent patient satisfaction even in patients under 30 years of age, might replace EBD as a primary procedure in such patients. Sensitivity of the distal esophagus may be retained in young patient with achalasia.